Boxen : Childhood Chronicles Before Narnia was my birthday gift to myself. (It's been a few months.) I keep meaning to tell you about it and other things keep coming up but here I am and I bet you didn't even notice, didja? 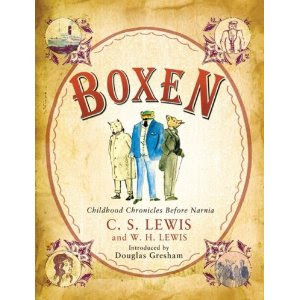 Boxen: Childhood Chronicles Before Narnia is filled with the stories that C.S. Lewis wrote with his brother, Warren, when the two were just little imaginative boys in Ireland. If you are a Narnia fan, no doubt you've heard of "Jacksie" Lewis beginning his writing career by creating a history and story around Animal-Land. Those stories are included in this book! So if you've ever been curious to know what the Lewis boys wrote to entertain each other - Boxen is your ticket to that world! I didn't realize that the stories existed (still) and were available for public consumption until just recently. Boxen doesn't read like C.S. Lewis' other stories. It is, after all, the childhood imaginations and dreams of a young lad who was scribbling away as something of a hobby. You would probably enjoy the read about as much as you would reading anything that your 7 or 8 year old might write. "Cute," you would think to yourself. You would smile and nod and unless it was genius, you wouldn't spend a great deal of time with it. That's rather how I feel about Boxen . I think it's incredible and amazing to be able to dive into the Lewis boys' world and see how C.S. brought animals to life in speech, history and geography. He had remarkable talent and that is instantly obvious when picking up this particular book. For the curious, this book is a wonder. For a read-aloud or a recreational read it's not much. Boxen is more for the curious and strong-hearted Lewis fan and, as such, I am thoroughly glad to have it on hand. It is a rare opportunity to see where a favorite author had his beginnings and that, my friends, is a treat indeed! I'd not heard of this. Looks like fun! Wow...getting into the mind of an author when they were a child...and not just any child! How cool! I had no idea they were published! It's going on my list! I used to have 'Boxen.' I hope it won't get me kicked out of the Lewis fan club to admit that I found the stories deadly boring... But I love seeing "how it all began." It gives me patience with the imaginative tales being spun out all around me, every day, by the under-10 set. Janet - haha! Nope. I didn't enjoy it as a recreational read at all, as I mentioned. I really only found it interesting from the "look at where he came from" perspective which I found fascinating but not something that I would spend a lot of time studying, etc. It's a fascinating curiosity but not meant for pleasure reading, in my opinion.